Author and Alpinist Robert Cocuzzo grew up skiing in New England, at Nashoba Valley Ski Resort in Westford, MA. Later, while researching his book on big mountain ski legend Doub Coombs, Rob would ski in Alaska, Wyoming, Chamonix, and the mountain that ultimately claimed Doug's life...La Meije in La Grave, France. Here's a snippet from a story Robert wrote for Departures Magazine on his time in La Grave. Read the rest of Robert's story here. 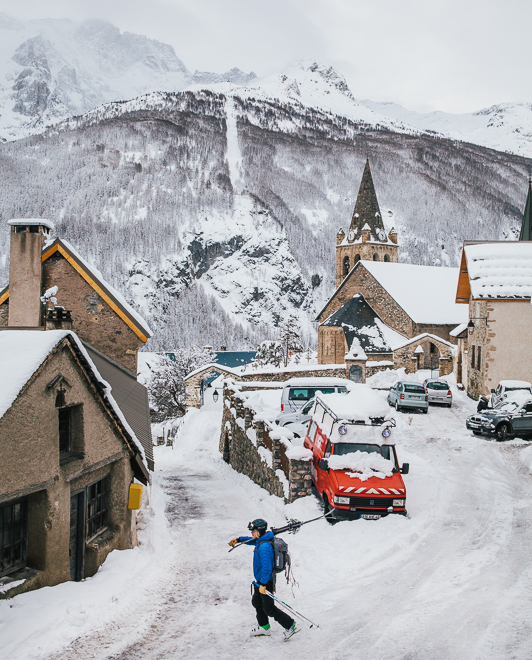 Forty-eight miles southeast of Grenoble, France, off a precarious road cut through the Romanche valley, the 12th-century farming village of La Grave has quietly become one of the last bastions of lift-accessed backcountry skiing. The French call it ski sauvage: there’s no ski patrol, no avalanche control, no boundary lines, no marked runs. You can’t just take the lift up from La Grave and then piece your way down. Following the tracks of another skier could lead you to the edge of a cliff, where the only way down is to rappel. Rescue comes in the form of a helicopter. On certain runs, La Grave is the very definition of extreme skiing: Fall and you die. Many say that La Grave is what Chamonix was a half a century ago. The sleepy village of about 500 people is enchanting, made up of ancient stone buildings, artisan shops, and a dozen restaurants and hotels that forgo the chichi après-ski scenes found throughout the Alps. All ofthis sits in the long, foreboding shadow of La Meije, the “Goddess of l’Oisans,” a 13,065-foot peak that dominates the sky and inspires as much fear as awe.